Ever find yourself smack in the middle of one of life’s “ruts?” Whether it lasts a couple of weeks or a couple of months, you find yourself wondering what a nice peaceful day would feel like. Dentist visits, doctor visits, transmission problems, trips to the vet, broken water pipes, dishwashers that go on the fritz (God forbid! )… they’re all part of life, unfortunately, but they’re more tolerable when they come one at a time, aren’t they? When they double, or even triple team you, that’s when nerves get frazzled. The problem is, it’s been my experience that these thorns of life aren’t fond of flying solo. They love company, so they almost always bring other thorns with them. Spring with its tree buds, blooming flowers, and greening grass – everything seems to come alive. Summer with its intense greens, yellows, reds, blues, and purples – everything seems to thrive. Autumn with its crisp leaves, colorful trees, and autumn breeze – everything seems to show off! Winter with its blankets of white, bare trees, and peaceful quiet – everything seems to sleep. Thorns never answer back, do they? One morning, as I was packing away pumpkins, ghosts, monsters, and bats and replacing them with the Holy Family, snowmen, reindeer, and Santas – I couldn’t help thinking about the seasons. Each one brings its own bag of tricks, so to speak. Each has things I love about them and each has things that I don’t particularly love. But not only can we NOT fast-forward any of the seasons or skip them, altogether, I don’t think many of us would even WANT to. Putting up with mosquitoes in summer and shoveling snow in winter are all part of the game. We get through it. 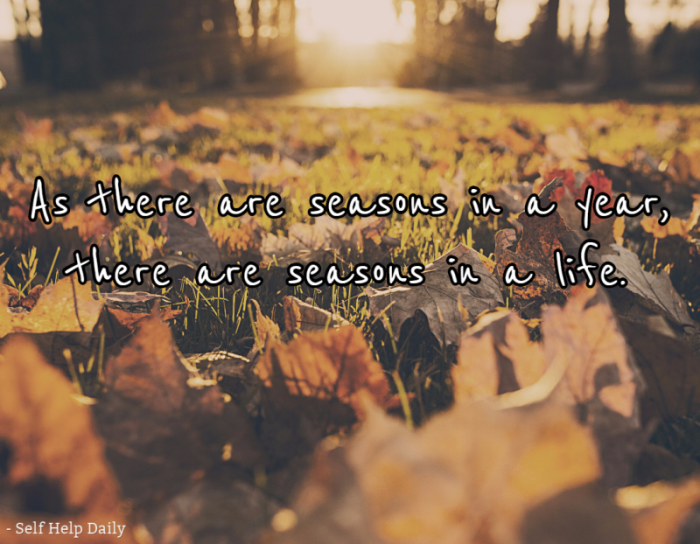 Even people who don’t like a particular season somehow get through it. The same holds true for life. Life also comes with its own seasons – joyous seasons, crazy seasons, peaceful seasons, sick seasons, restful seasons, and seasons when anything that COULD go wrong, DOES go wrong! You know, the “Reallllly?” seasons. I guess all I’m trying to say is this: No matter where you are right now – no matter what sort of life season you’re in… whether it’s one you’re enjoying or one you’re just trying to get through – know that it will not last. Another season will come and take it’s place. What can you do when you’re in a “thorny” season?! Breathe. When under stress, we sometimes hold our breath without even realizing it. Be cognizant of your breathing and make sure to inhale and exhale. This, alone, can actually make you feel better. Slow everything down – your mind and your body. When you’re in a bad season, your mind races. It’s trying to figure out how to get out of the rut, how to deal with the rut, how to make everything okay for everyone else… race, race, race. When your mind races, your body tries to keep pace. If your mind treats everything as an emergency, your heart will think you’re under constant attack! Slow everything down and realize that you aren’t under attack from zombies. Save the panic for the walking dead. Remind yourself that you are simply in one of life’s seasons – it will pass and another will come along. One day the things that are driving you batty right now will be nothing more than memories. Go ahead and remind them of that. If there is anything you can do to make the situation better, don’t just think about it (and don’t ever just wait for someone else to do it) – take action. Very often, the simple act of knowing you’re doing all that you can brings you a measured amount of relief. Never let them see you anything but in control… riding out the bad season until a better one comes along. Endure the storm with your dignity intact! One final thought: If you’re going through rough or challenging waters, odds are that you have loved ones in the boat with you. The calmer you remain – the more “in control” you are – the better it’ll be for everyone else. Many times, our loved ones follow our lead. If we act all kinds of crazy, they’ll do the same. Bad. Deal. That’s the sort of thing that causes boats to capsize. Don’t be the reason the boat capsizes. Be the reason the boat makes it to calmer waters.